Jack Albertson (June 16, 1907 – November 25, 1981) was an American character actor, comedian, dancer, singer and musician, who also performed in vaudeville. Albertson is known for his roles as John Cleary in The Subject Was Roses (1968), for which he received an Academy Award for Best Supporting Actor; Grandpa Joe in Willy Wonka & the Chocolate Factory (1971); Manny Rosen in The Poseidon Adventure (1972); and Ed Brown in the television sitcom Chico and the Man (1974–78). For his contributions to the television industry, Albertson was honored with a star on the Hollywood Walk of Fame at 6253 Hollywood Boulevard. Jack Albertson was born on June 16, 1907, in Malden, Massachusetts, the son of Russian-born Jewish immigrants Flora (née Craft) and Leopold Albertson. His older sister was actress Mabel Albertson. Albertson's mother, a stock actress, supported the family by working in a shoe factory. Until at least the age of 22, Albertson was known as "Harold Albertson". Albertson worked in burlesque as a hoofer (soft shoe dancer) and straight man to Phil Silvers on the Minsky's Burlesque Circuit. Besides vaudeville and burlesque, he appeared on the stage in many Broadway plays and musicals, including High Button Shoes, Top Banana, The Cradle Will Rock, Make Mine Manhattan, Show Boat, Boy Meets Girl, Girl Crazy, Meet the People, The Sunshine Boys – for which he received a Tony Award nomination for Best Actor, and The Subject Was Roses – for which he won a Tony for Best Supporting Actor. Albertson appeared in more than thirty films. He had an early minor role in Miracle on 34th Street as a postal worker who redirects dead letters addressed to "Santa Claus" to the courthouse where Kris Kringle is on trial. He won an Academy Award for Best Supporting Actor for his role in the 1968 film The Subject Was Roses. He later apologized to Jack Wild for winning the award; Wild was also nominated and Albertson expected Wild to win. Albertson said that his one regret was that he did not reprise his role in the movie version of The Sunshine Boys. When producer Ray Stark acquired the film rights from Neil Simon in 1973, it was expected that Albertson would play the part, but by the time MGM had bought the rights in 1974 and was preparing to begin filming in February 1975, Albertson was not available because he was appearing on Chico and the Man on TV. Albertson was a radio performer early in his career was known for appearing on two programs, Just Plain Bill and The Jack Albertson Comedy Show. Later, he was for a time a regular on the Milton Berle Show in the late 1940s. Albertson appeared in many television series, such as Hey, Jeannie! with Jeannie Carson; the syndicated western series Frontier Doctor with Rex Allen; Rod Cameron's syndicated crime drama State Trooper; and the 1961–62 drama series Bus Stop. He guest-starred on the David Janssen crime drama series Richard Diamond, Private Detective. From 1960-61, Albertson was cast in three episodes of Pete and Gladys, with Harry Morgan and Cara Williams. On January 2, 1961, Albertson was cast as Sampson J. Binton, with DeForest Kelley as Alex Jeffords, in "Listen to the Nightingale", the series finale of Riverboat, starring Darren McGavin. Albertson had a recurring role as the neighbor Walter Burton in eight episodes of the 1962 ABC sitcom Room for One More, with Andrew Duggan and Peggy McCay. He had recurring roles in Ensign O'Toole (1962–63) and Run, Buddy, Run (1966). Other 1960s series on which Albertson appeared were NBC's sitcom, Happy starring Ronnie Burns, and Glynis, starring Glynis Johns and Keith Andes, which aired for 13 weeks in the fall of 1963. Albertson appeared in two episodes of The Twilight Zone. In a 1967 episode of The Andy Griffith Show, he played the n'er-do-well cousin, Bradford J. Taylor, of series character Aunt Bee (Frances Bavier). He co-starred as "The Man" Ed Brown in Chico and the Man, with Freddie Prinze, for which he earned an Emmy. He resided for many years in West Hollywood, California. In 1978, he was diagnosed with colorectal cancer, but kept this information private and continued to act. Two of his last roles were in the television movies, My Body, My Child (1982) and Grandpa, Will You Run With Me? (1983), both filmed in 1981 several months before his death, both of which were released posthumously. His final theatrical role was as the ill-tempered hunter, Amos Slade, in Walt Disney's 24th animated feature, The Fox and the Hound, originally released in the summer of 1981, four months before his death. Albertson died on November 25, 1981, at the age of 74, after a three-year battle with colorectal cancer. He was survived by his wife, June (July 23, 1924–January 9, 2015) and his daughter Maura Dhu. He and his elder sister, Mabel Albertson, (who died ten months later from Alzheimer's disease), were cremated and their ashes were scattered in the Pacific Ocean. Bookie episode: "Out at the Old Ball Park"
Salesman episode: "Bentley and the Finishing School"
episode: "Woman of the House"
Police chief episode: "Have You Stopped Beating Your Wife?" episode: "Maynard G. Krebs, Boy Millionaire"
episode: "'You Ain't Nuthin' But a Houn' Dog"
episode: "Competition Is the Life of Trade"
1966–67 Run for Your Life Harry Krissel episode: "Cry Hard, Cry Fast"
Enos Blessing episode: "The Sound of Sadness"
episode: "A Girl Named George"
Nathaniel E. "Doc" Watson episode: "With Love, Bullets, and Valentines"
episode: "The Girl in the Shadows"
Danny Wilson episode: "Cowtown Hustle"
episode: "One for the Road"
↑ "Wallace Thomson Albertson Obituary". Los Angeles Times. Legacy.com. April 26, 2015. ↑ Blau, Eleanor (November 28, 1981). "Jack Albertson, Versatile Star of Stage, Film and TV Series". The New York Times. ↑ Jones, Jack (November 26, 1981). 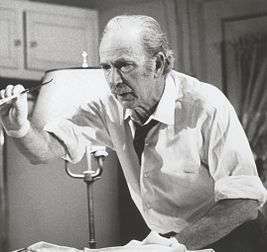 "Jack Albertson". Los Angeles Times. Retrieved May 5, 2016. ↑ "Hollywood Walk of Fame database". HWOF.com. Retrieved October 19, 2015. 1 2 3 Jack Albertson's Kinship to Cloris Leachman, genealogymagazine.com; accessed October 19, 2015. ↑ Berkvist, Robert (January 7, 1973). "Jack Spreads A Little Sunshine; Jack Spreads Sunshine". The New York Times. Retrieved 2010-05-05. ↑ ""Listen to the Nightingale", Riverboat". IMDb.com. January 2, 1961. Retrieved February 21, 2013.